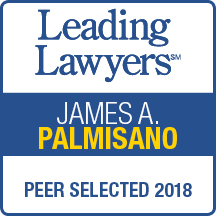 James A. Palmisano is the founder and principal attorney at Palmisano Law Group, an Orland Park law firm serving Chicago and surrounding areas in all aspects of divorce and family law. A native Chicagoan, James has been a family law practitioner for over 40 years. He is AV-rated, Martindale-Hubbell’s highest peer recognition for ethical standards and legal ability, and he is listed in Illinois Super Lawyers for 2018 in the area of Family Law, a publication which recognizes the top five percent of family law attorneys in the State of Illinois. James is listed as a top-rated Chicago family law attorney 2018 as published in the Chicago Tribune, has been named by his peers as an Illinois Leading Lawyer in family law for 2018, and was selected by his peers to be included in the 2018 edition of Best Lawyers in America. James’ practice is individually tailored to the needs of each of his clients who receive the amount of attention necessary to achieve a successful outcome of their family law disputes. He has with dignity, yet fierce tenacity, guided his clients through their legal proceedings with impeccable attention to detail, meticulous case management and zealous advocacy. His successful practice has generated favorable judgments and settlements involving high-income and complex property division, spousal support, child custody and visitation issues. He has a breadth of experience in all areas of family law and has earned an outstanding reputation in the legal community. He is committed to handling his clients’ legal matters in strict confidence. James’ service to the legal profession in the area of family law has been extensive. He has served as a court-appointed Certified Child Representative, Attorney for Child, and Guardian ad Litem in numerous cases involving child custody and visitation disputes in the Circuit Court of Cook County Illinois for over 30 years. Since 1996, James has served on the court’s Domestic Relations Management Advisory Committee, advising sitting judges in the domestic relations division on family law matters. He served as an appointed member on the court’s Subcommittee on Family Violence Prevention Coordinating Council. He also served as an appointed member to the Illinois State Bar Association Family Law Section (1981-1984) and as a member of the Illinois State Bar’s Family Law Section Subcommittee on Divorce Mediation (1983-1984). He served as Chair of the Family Law Section’s Subcommittee on Bankruptcy/Hold Harmless Agreements (1983-1984). James has served as a member of the Chicago Bar Association Lawyer Reference Program in Family Law since 1980. His speaking engagements have included delivering a seminar to the Family Law Section at the Illinois State Bar Association Annual Convention in 1983 and presenting a continuing education program for Child Representatives in the Cook County Circuit Court on the topic of Supervised Visitation in 2007. Mr. Palmisano was cast as lead counsel for the petitioner in a video production, “Domestic Violence Case Presentation” produced by the Family Violence Prevention Coordinating Councils for viewing by the general public as an information tool to victims of domestic violence.